Lu9 is a contributor who joined MFGG in Jul 29, 2009 later on the forum in Mar 03, 2013. When Lu9 registered, he was focused on sprite sheets, which got declined by moderation due to being unorganized or useless. After getting "mad" at the staff because they weren't accepting his sheets, Lu9 didn't submit anything until 2012. In 2012, Lu9 uploaded his first game: Guide Luigi: The Mini-Game. Overall it was rated 2.5/10 due to clashing graphics and the engine used. In 2013, for the Year of Luigi, he made the fangame Luigi and the Quest for Nothing, which got fairly positive reviews. In late 2015 he started developing what would become the first major Super Mario Maker-based fangame, Super Mario ReMaker, which got cancelled in early 2016 to avoid copyright issues with Nintendo, who already had taken down his YouTube channel due to the trailers. Currently he is developing the sequel to Luigi and the Quest for Nothing, and he has released a revisit to the original game in 2017. 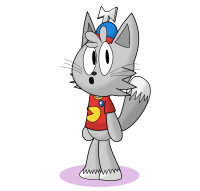 Lu9's ref was a gray egg-looking character with long ears and a blue and red propeller hat (referencing Homestar Runner) and a red shirt with a pizza logo on it (referencing LEGO Island). His newer ref is now a cat, but still based on the old one. Lu9's first game ever to feature on MFGG was Guide Luigi: The Minigame, the rest of his games at the time were located in his Yoyogames sandbox page, which mostly were "Slightly Edited" Hello Clones. Lu9's first sprite uploaded in MFGG was 3 poorly MS Paint edited sprites of Mario. This and more sheets of him were declined back in 2009/2010. Recently, lu9's first sprite sheet on the site is a MS Sans Serif font in SMB3 Style, and the last one until now is a rip from Mike Wiering's Super Angelo. One of Lu9's first sheets uploaded on the main site (which got declined) consisted of random MS Painted Goombobs with different expressions and actions. In "honor" to one of his first fangames, Lu9 will hide Winnie the Pooh in every of his fangames, as an easter egg, cheat, or cameo. In fact, Winnie the Pooh: Lost in Mario World is represented in a tile in the Isometric Collaboration #6. This page was last edited on 5 November 2017, at 04:11.